2016 The First International Conference On Economic and Business Management (FEBM2016) will be held in Qingdao during October 15-17, 2016. The aim objective of FEBM2016 is to provide a platform for researchers, engineers, academicians as well as industrial professionals from all over the world to present their research results and development activities in Economic and Business Management. The proceedings have been successfully indexed by CPCI. All submissions will be peer reviewed and evaluated based on originality, technicality and research content/depth, relevance to conference. Papers should be conforming to the conference topic. and formatted according to the paper format. Through the Submission System Or send it to mailbox: febm2016@163.com. FEBM 2016 will be published by Atlantis Press (Advances in Economics, Business and Management Research ISSN 2352-5428), which will be submitted for indexing by ISI, CPCI and EI Compendex. FEBM 2016 is a key support conference of Atlantis Press, and has listed in the conference list. The paper not mentioned above is pending with results. 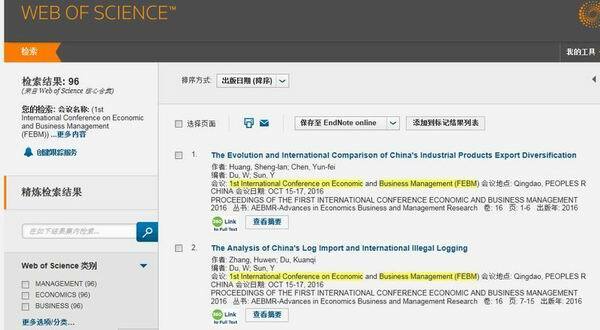 FEBM2016 has been included in ScienceNet.cn. FEBM2016 has been included in CNKI. All the articles recieved will be indexed by CNKI.